This Blueberry Balsamic Grilled Cheese takes your grilled cheese game to a new level, with fresh berries, goat cheese, prosciutto, and arugula! Mix together all sauce ingredients. Lightly spread olive oil onto outward facing side of each piece of bread. Layer on the filling ingredients in this order (to keep it all from falling out): ½ balsamic mayo mix, spread on goat cheese, arugula, prosciutto, blueberries, white cheese, ½ balsamic mayo mix. Grill on medium heat for about 5 minutes, flipping halfway through, or until everything is melted and hot. Turn up the heat to medium/high and cook about 30 seconds on both sides, or until light brown and crisp. Eat immediately after cooking to avoid the bread becoming soggy! This isn’t exactly low fat or low sodium. Lighten it up and add some nutrition by nixing the olive oil and spraying the pan with a cooking spray, reducing cheese by half, or by opting for a whole wheat bread with more fiber. 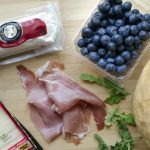 If you’re looking to cut back on sodium, sub the prosciutto for a low-sodium variety of sliced roasted turkey. Recipe from Live Eat Learn at https://www.liveeatlearn.com/blueberry-balsamic-grilled-cheese/.